We’re approaching that time of year when we tend to reflect on what we have accomplished over the last year and what we want to strive for over the coming year. And often this exercise also involves reflecting on our relationships and what we want from them. 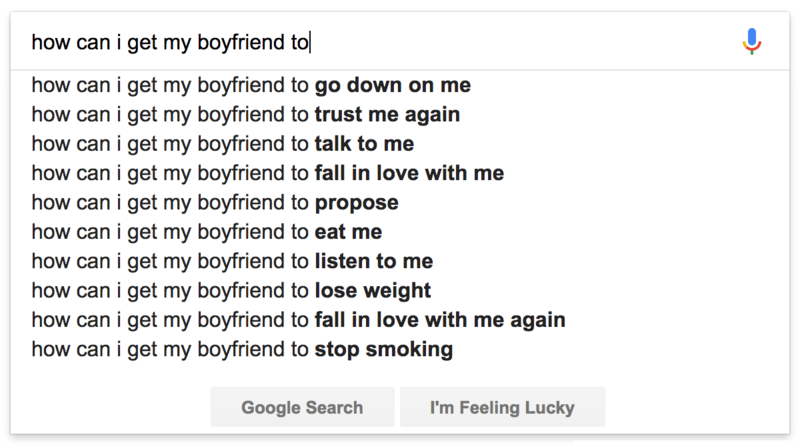 I decided to use googles predictive search feature to get a hive mind idea of what people want from their boyfriends and girlfriends. 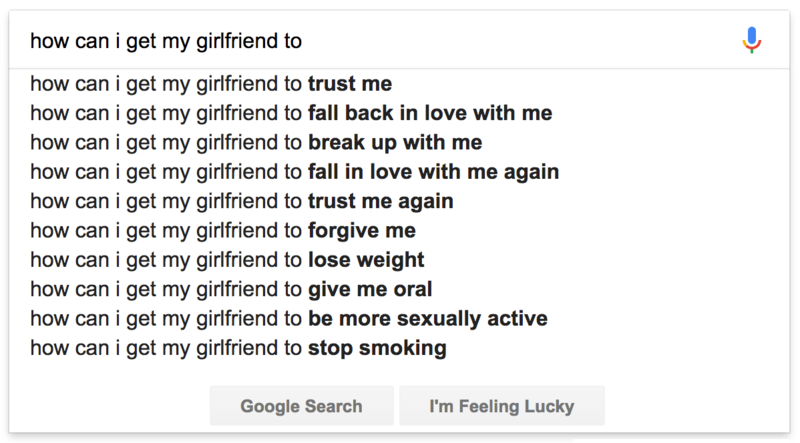 There is a lot of the same themes going on from both searches. I both love and hate how Google allows a window each other’s fascinating, curiosities and troubles. That’s one helluva long train! Is this train entering the tunnel or leaving it? Actually, it doesn’t matter, with a little concentration you can change its direction just by thinking about it. Thanks to multistable optical illusions your thoughts create your reality. The same effect is used to create these two spinning lady illusions. A research group at Imperial College London have made what major break through in understanding LSD’s impact on the brain. The first modern brain scans of people high on the drug have given researchers an unprecedented insight into the neural basis for effects produced by LSD. The scientists measured blood flow, functional connections within and between brain networks, and brainwaves in the volunteers on and off the drug. The brain scans revealed that trippers experienced images through information drawn from many parts of their brains, and not just the visual cortex at the back of the head that normally processes visual information. Under the drug, regions once segregated spoke to one another. Further images showed that other brain regions that usually form a network became more separated in a change that accompanied users’ feelings of oneness with the world, a loss of personal identity called “ego dissolution”. There is more about the findings in the Guardian article: LSD’s impact on the brain revealed in groundbreaking images. More images and detailed information can be found in the original paper. Which Way Is This Lady Spinning? Here is another fun spinning lady optical illusion. The pointillist figure seems to be spinning in both directions at once. However, if you concentrate on her missing arm you’ll find she is spinning in a counter-clockwise direction. It reminds me a lot of this other spinning lady optical illusion. Cool. Nervio was a sensation I have felt so many times in my life I was shocked that I had not, up until that point, seen a word that describes it. Nervio brings to mind phrases like, “I’m gonna squeeze you right in two” and, “Oh, I could just eat you with a spoon.” Nervio is why I am constantly threatening to nibble on my children’s toes. It’s a physical and emotional sensation that sits in the gut and wells up through you. 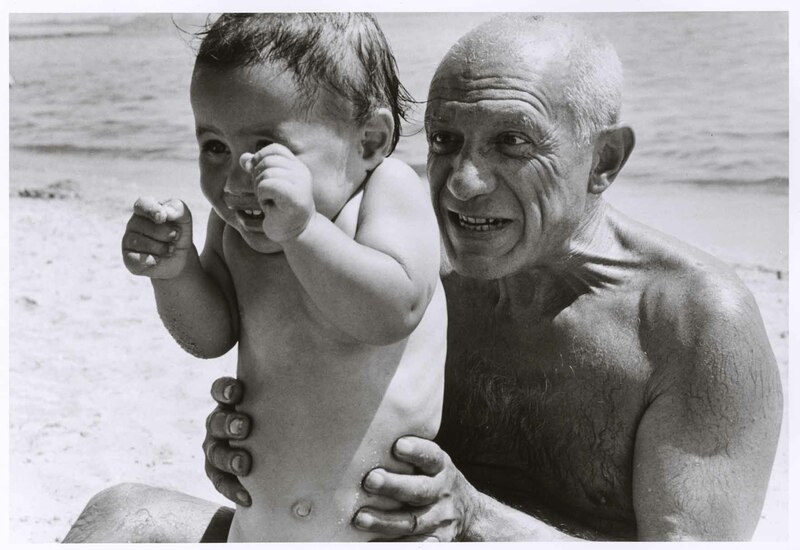 The Robert Capa portrait, below, of Pablo Picasso with his son Claude does a good job of depicting the sensation with an image. There has been some psychological research experiments to determine where nervio comes from but there are still a lot of unanswered questions. Here is an interesting chart from the folks over at Information Is Beautiful showing how your therapist sees you. They call it a “psycho-dimensional infographic for navigating the psychotherapeutic conception of the individual self and its defenses”. I call it “Why Do You Think You Are Nuts?“. Although I consider my self pretty mentally and emotionally healthy I probably fall on the Healthy/Oral/Rigid side of the wheel. How about you? They are ‘glass half full’ people – while still being practical and down-to-earth. They have an ability to find the good in any situation. They understand that happiness is a choice, and consciously and methodically create their own happiness, while others hope happiness will find them. They are ambitious. They don’t believe in, or wait for fate, destiny, chance or luck to determine or shape their future. They take control and choose to live their best life rather than spending it on auto-pilot. They have clarity and certainty about what they want and don’t want for their life. They visualize and plan their best reality while others are merely spectators of life. They have identified their core values – what is important to them – and they do their best to live a life which is reflective of these values. They ask the right questions – the ones which put them in a happy, creative, positive mindset and emotional state. They rarely complain because they know it’s a waste of energy. All complaining does is put the complainer in a negative state of mind. They don’t procrastinate and they don’t spend their life waiting for the ‘right time’. They are busy, productive and proactive with their goals. While most are laying on the couch, over-planning, over-thinking, sitting on their hands and generally going around in circles, they are out there taking steps in the right direction. They are fearful like everyone else, but they are not controlled or limited by their fears – they face them and grow beyond them over time. They don’t blame others. They take complete responsibility for their actions and outcomes, or their lack thereof. While they are not necessarily more talented than the majority, they always find ways to maximize their potential. They get more out of themselves by exercising their talents and their passions. In other words, they use what they have more effectively, which leads to long-term personal achievement and happiness. The 18-year-old, Florence Colgate, @flo245 on twitter, has been blessed with what has been deemed the most naturally beautiful face in England. 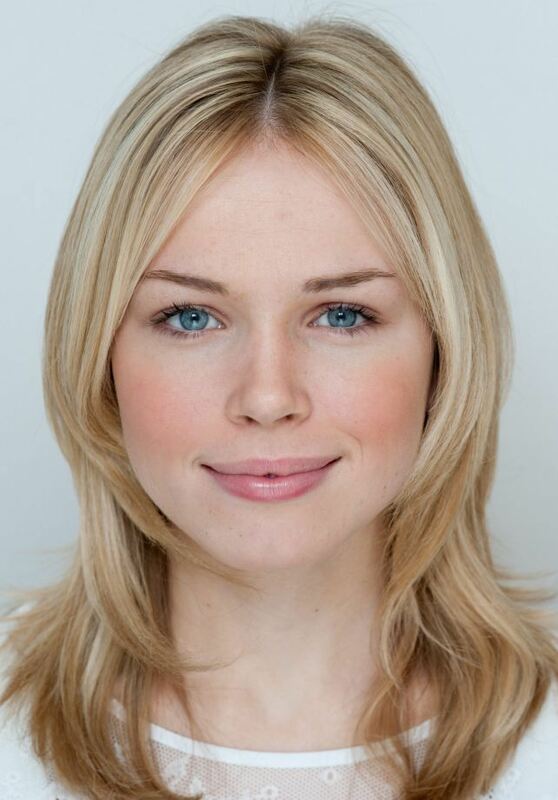 She’s the winner of a contest – beating out 8,000 other contestants – for having a near perfectly symmetrical face based on ratio figures that were collected by researchers. A woman’s face is said to be most attractive when the space between her pupils is just under half the width of her face from ear to ear. Florence scores a 44 per cent ratio. Experts also believe the relative distance between eyes and mouth should be just over a third of the measurement from hairline to chin. Florence’s ratio is 32.8 per cent. The answer lies not in fancy geometry but in two basic relationships: whether the left side matches the right (symmetry), and whether the proportions match those with which we are most familiar (normality or ‘averageness’). That beauty should lie in averageness is paradoxical, because we tend to think of ‘average’ as mundane. Sure, the most beautiful faces do not have average proportions, but nonetheless learning what is ‘normal’ for the faces around us is a powerful force in defining what for us is beautiful. This proves itself when you look at the hundreds of comments at the at the Daily Mail and Huffington Post which refer to Colgate as “boring”, “average”, and “bland”.